My first attempt didn't work because I was between gauges, and because I attempted to be clever when picking up stitches for the thumb, and because my idea of striping turquoise and gray just made the mitten look dirty. I frogged and restarted with smaller needles (getting a solid 5 spi) and made turquoise mittens with gray cuffs. My mom loves them! The pattern is good except that it leaves a huge gap at the base of the thumb that you have to sew up. Nice! Now I know what I want to do this afternoon -- make mittens! Very pretty! 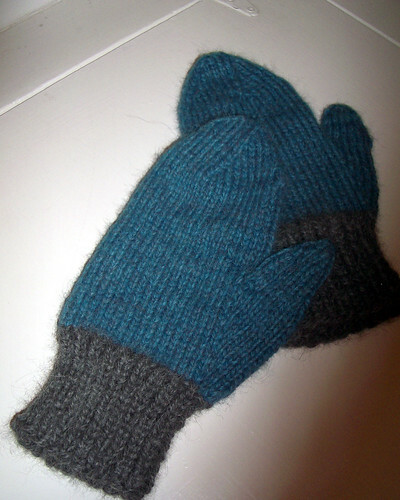 Some crochet mitten and glove patterns have that hole at the base of the thumb. I like setting things up so I'm sewing as little as possible. Yeah, I think I want to find a different pattern that doesn't require sewing up the hole. I have the Selbuvotter book. Maybe that has some tips. Lovely! I like the solid turquoise with the grey cuff very much.